The Navy’s rare move to simultaneously assemble three aircraft carriers in the Pacific will create a major display of American sea power at a time when President Donald Trump is planning to visit the region for the first time next week. The three Navy carriers — accompanied by more than 20,000 sailors, hundreds of aircraft and an array of destroyers and cruisers — will all be underway in the Japan-based 7th Fleet’s area of operations. It’s an unusual occurrence and comes at a time of rising tension with North Korea, which has repeatedly threatened the United States and continued provocative missile tests during the past several months. The last time the Navy operated three carrier groups together was 2007, Marine Lt. Gen. Kenneth McKenzie Jr. told reporters Thursday. The West Coast-based carriers Nimitz and Theodore Roosevelt will be joined by the Japan-based carrier Ronald Reagan. 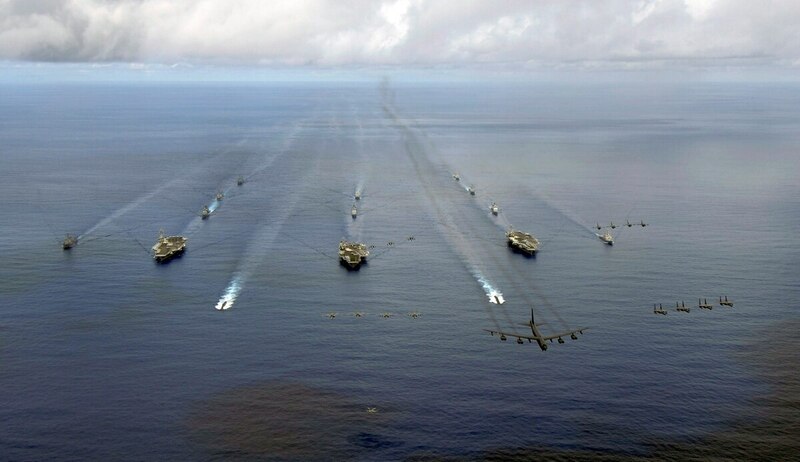 A joint exercise involving the three carriers has not been publicly announced, but Navy officials who spoke on the condition of anonymity said the planning is underway. It’s expected that the carriers will meet up for a photo opportunity, the kind that has little operational significance but plenty of symbolism for both allies and adversaries in the region, according to an official with knowledge of the discussions. The White House has announced Trump’s 12-day trip to Asia starting on Nov. 3. The commander in chief will make stops in Hawaii, Japan, South Korea, China, Vietnam and the Philippines. One defense official said the carriers’ overlapping deployments schedules were set months before the White House finalized its plans for Trump’s visit. “It’s certainly not something we planned to coordinate with anyone else,” said the defense official, who requested anonymity because he wasn’t authorized to speak on the subject. At the time the carrier deployments were planned, the messaging was directed more towards the simmering dispute over China’s claims in the South China Sea rather than North Korea, an official said. Chairman of the Joint Chiefs of Staff Gen. Joseph Dunford was in South Korea this week, and downplayed the timing of the carriers’ arrival, saying the movement was scheduled months in advanced. Yet many Navy experts say the message will be undeniable when so much air and sea power amass in a region where a U.S. president is visiting, and in the back yard of North Korea. “No doubt a lot of observers will note the confluence, and will put two and two together,” Jan van Tol, a retired Navy skipper who commanded warships in 7th Fleet, told Navy Times. Carrier groups overlapping in a command is not unusual, van Tol said. However, he added, “What would be interesting is if one or both of the [West Coast-based carriers] made a port visit in Japan or South Korea. “That might well be signaling to regional actors,” van Tol said. The Navy has a total of 10 aircraft carriers, and none of them are currently in the U.S. Central Command region, Navy officials said. Some have expressed concern that, in a high-tension situation like the one festering between Washington and Pyongyang, slight missteps or misunderstandings could spark a conflict. Van Tol said he doesn’t see the carriers amassing in the region while Trump visits as one of those catalysts. “Contrary to the crazyman stereotype of Kim Jung-Un, Kim and the regime are highly rational, if deeply evil,” van Tol said. Operationally, however, three carriers is a “magic number,” said Jerry Hendrix, a retired Navy captain who is now a senior fellow at the Center for a New American Security think tank. One carrier can operate 12 to 14 hours a day before it has to shut down for deck maintenance and crew rest. Two carriers can operate for 24 hours a day, but only for six days in a row. On the seventh day, one needs to stand down for maintenance, while the other would do so on the eighth day, he said. “But when you get to three carriers, you can get a critical reaction where you can go 24/7, 365,” Hendrix told Navy Times. Still, Hendrix thinks the three carriers converging is more a case of “coercive diplomacy” than any preparation for a military operation. The strike groups send a message not only to North Korea, but to China, where Trump is expected to visit next month. “I would not be surprised if the exercises occurred in some geographic region that’s being contested to demonstrate the United States has the ability to operate on the high seas when and where it wants,” Hendrix said. The fact that the Pentagon is signaling that the carrier exercise will happen also shows this is not preparation for an attack, he said.